How did you first learn about the HCG Diet? I first learned about the HCG diet in a book that was accidentally sent to me. I had ordered “Natural Cures ‘They’ Don’t Want You to Know About” and they sent me “The Weight Loss Cure ‘They’ Don’t Want You to Know About”. I then passed that book onto my mother, Linda Prinster, who had been dieting her entire life. She read it and for the first time thought that the physician referred to in the book, Dr. Simeons, understood her. So, she started researching the HCG diet info, figured out how to do it (while writing the HCG Weight Loss Cure Guide), had great success, and started helping others around her. What made you decide to write the Pocket Guide to the HCG Protocol and My HCG Tracker? I put together the Tracker after working with HCG dieters both in person and over the phone who weren’t keeping track of their foods and personal care item usage. If they weren’t keeping track, they sometimes didn’t remember what all they had done in a certain day that may have caused them to stall or gain. So, I wanted to give them an HCG diet resource that would help them track their HCG weight loss and their HCG diet meals in one place. Plus, there are great motivational quotes on all the pages for the VLCD (very low calorie diet) phase of the HCG diet that really help people to keep moving forward. My mother, Linda Prinster, and I decided to put together the Pocket Guide to the HCG Protocol solely based on requests from our customers. They wanted to the motivational aspect of the Tracker plus the convenience of that amazing food chart from the HCG Weight Loss Cure Guide. So, we put aspects of each of those two books together to make a small, summary book that is easy to carry around during the VLCD and Maintenance phase of the HCG diet. 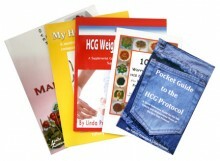 What was your favorite part of creating your HCG books? My favorite part is searching the Internet to read people’s reviews of the books or having customers email in to the HCG companies that I am involved in saying how much they use the books. It’s a great feeling to know you are helping someone achieve success in an area of his or her life. What do you think people will get from reading/using your HCG books? I think they will gain confidence in knowing they have great information from the books AND accountability from the HCG Tracker. It all just puts HCG dieters in a place of feeling secure and informed. Simple: If you are not going to do it 110% correctly (no mixing veggies, eating ONLY the foods allowed in Dr. Simeons’ original manuscript and in their correct quantities, no gum or mints, only coffee, tea, and water, not using any normal lotions or lip balms, etc. etc. ), then don’t even waste your time diddy-dallying and messing around with the HCG diet.